Presented schematic shows how to build simple PIR motion detector sensor. PIR sensors allow you to sense motion, almost always used to detect whether a human has moved in or out of the sensors range. They are small, inexpensive, low-power, easy to use and don’t wear out. For that reason they are commonly found in appliances and gadgets used in homes or businesses. They are often referred to as PIR, “Passive Infrared”, “Pyroelectric”, or “IR motion” sensors. 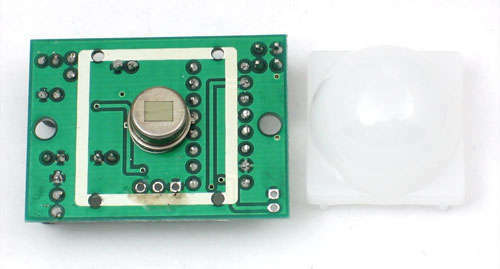 For many basic projects or products that need to detect when a person has left or entered the area, or has approached, PIR sensors are great. They are low power and low cost, pretty rugged, have a wide lens range, and are easy to interface with. Note that PIRs won’t tell you how many people are around or how close they are to the sensor, the lens is often fixed to a certain sweep and distance (although it can be hacked somewhere) and they are also sometimes set off by house pets. Experimentation is key! The following circuit shows PIR Motion Detector Circuit. 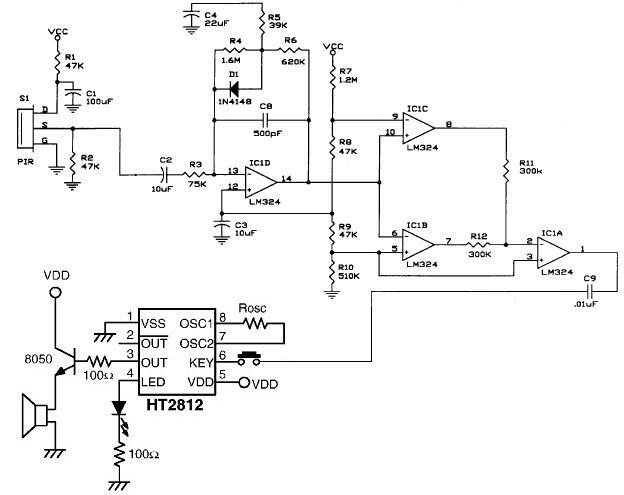 This circuit based on the HT2810 IC, Features: With The Passive Infrared Sensor (PIR), DC voltage 5V, 9 volts for the sound generator circuit. Component: IC, Resistor, Speaker, Diode, Capacitor, Transistor, Switch.